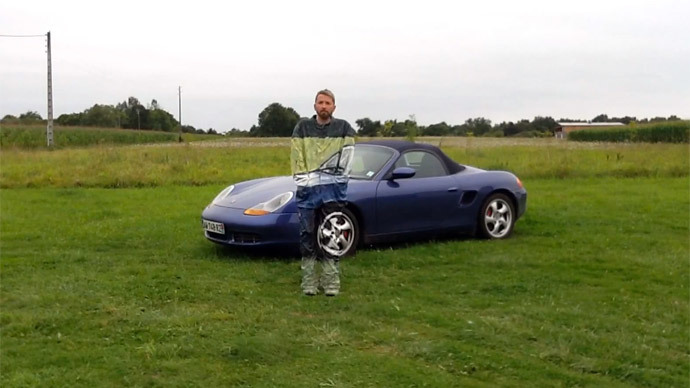 Paris artist has mastered a real art of camouflage worthy of spy movies and David Copperfield tricks – he literally makes people fade into cars, fridges and even shelves. Some paintbrush and you disappear from the scene. Family and friends are canvases good enough for French 'camouflage artist' Laurent La Gamba. His models are hovering in front of the chosen objects. “These people [models] are just relatives. Sometimes I work with students. Sometimes I work with friends. If I work in the public place I use the people that are working in this place,” La Gamba told RT. The 48-year-old artist started his path on the art of camouflage back in 2002. There is no Photoshop as one may think at first time – all the models have been carefully and thoroughly painted to fit in the scenery behind them. The choice of the environment is vast – it can be a large swimming pool or a small fridge or even shelves in the local supermarket. “The illusion of creating something that is really difficult to do technically is coming from my desire of trying to seduce the viewer,” says La Gamba. One of his latest conceptions is making people vanish in posh sport cars. He shot his eerie project in the Pyrenees, southern France, where he has a studio. The video with the cars is extremely difficult to do, says the artist. “My idea is always to challenge myself to discover a new project where the challenge is even more challenging all the time,” he adds.